1) Perl runs on all platforms and is far more portable than C.
2) Perl and a huge collection of Perl Modules are free software (either GNU General Public License or Artistic License). 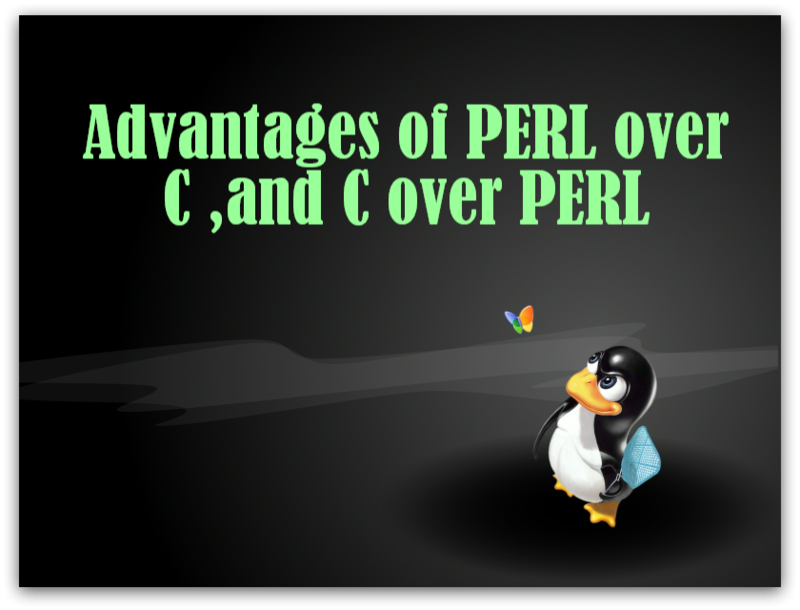 3) Perl is very much efficient in TEXT and STRING manipulation i.e. REG_EXP. 4) It is a language that combines the best features from many other languages and is very easy to learn if you approach it properly. 5) Dynamic memory allocation is very easy in PERL, at any point of time we can increase or decrease the size of the array. 1) You cannot easily create a binary image ("exe") from a Perl file. It's not a serious problem on Unix, but it might be a problem on Windows. 2) Moreover, if you write a script which uses modules from CPAN, and want to run it on another computer, you need to install all the modules on that other computer, which can be a drag. compiling language like C. So, it s not feasible to use in Real time environment like in flight simulation system.